Many great friends have come into my life in this journey to run 50 marathons in 50 states. I also have many virtual friends on Facebook, Instagram and Twitter with common enthusiasm for life and staying fit. A few months ago I received an email from one of these online acquaintances, Barbara Blackford from Atlanta, Georgia. She writes a blog ‘Fitter after 50’ and is what she calls a “recovering lawyer”. When she found out Georgia was still on my to do list of states, she performed an amazing act of charity. Bare in mind she had never even met me, she single handedly donated Sky Miles, arranged a hotel stay and helped get the Georgia running group, MARC (Metro Area Running Club) to sponsor me for the Atlanta Publix Marathon. This is what I call ultimate Southern hospitality!!!!! This would be my first marathon of the new year and with all this pressure not to disappoint this wonderful lady I don’t mind saying I was a bit nervous. Not running a marathon, I’ve done enough of those not to worry too much about that but more about making a good impression. I have this bad habit of speaking and then as I watch the words leave my mouth that’s when I realize maybe I should have thought them out a little better first. By then the words are already half way to the intended persons ear and are impossible to recall. I guess you could say I suffer from ‘foot in mouth’ disease. But thank goodness my lovely wife, Lynette was able to accompany me on this race and she would be my mouth muffler. As we arrived at the Atlanta Airport Barbara was there to pick us up and take us over to the marathon expo and then to our hotel. What a nice expo! I love all the excitement and energy of literally thousands of runners picking up their bib numbers. Some for their very first marathon and others who have run many marathons. Our hotel was located right in downtown Atlanta. We were walking distance from all the sites and attractions. The race was on Sunday and since we arrived Friday afternoon that meant Saturday would be a free day of site seeing and having fun. Atlanta is a beautiful city with a rich culture. Our first stop was at the Martin Luther King Museum. This was one of the most Impressive and thought provoking places I have ever visited. To be honest really did not understand the magnitude of MLK or what he did. Sure I knew he was instrumental in the equal rights movement, but I now have a pretty good understanding why we all owe this man our respect and gratitude. Next we toured the Olympic Park area. The park was built for the Summer Olympics in 1996. CCN was located in this same area along with the World Headquarters for Coca-Cola. Let’s not forget one of the largest Aquariums in the United States. We also had a really amazing lunch in the Sundial Restaurant. It’s located on the top of the Westin Peach Tree Plaza which is over 700 ft tall. You eat your lunch while the restaurant slowly spins giving you a view of the entire city of Atlanta. It took me a few minutes to get over my motion sickness and enjoy my delicious lunch. surprise there isn’t a whole lot of south left in Atlanta these days. It’s a very modern city. This is why Marietta decided we needed to eat dinner at a traditional southern food restaurant, JCT’s Kitchen and bar. Of course I got my favorite, fried chicken, biscuits and collard greens. Marietta, who I had just met, agreed to run slow and stay with me and be my guide during this race. She is a heck of an athlete and I’m sure she could have cut an hour off her time if she wasn’t being held back by me. Both Marietta and I are talkers, we were able to keep each other entertained the entire race and then some. Sunday came I awoke feeling great and ready for the marathon to begin. We met at the MARC tent and I met all the amazing people in their running group. I had developed a slight cough while in Georgia and I was told it was from the unusual amount of pollen that falls in Atlanta. As we ran we past cars with yellow pollen dust so thick you could draw your name on their hoods with your finger! The temps on Sunday were a perfect 45 to 50 degrees during the start and never got above 70 by the end. This certainly helped since the course was very hilly and quite difficult. I was very excited to be running the race with all my new MARC running friends so I didn’t notice just how tough the course was…at first anyway. By the halfway point my legs were starting the feel the burn of the seemingly never ending hills. 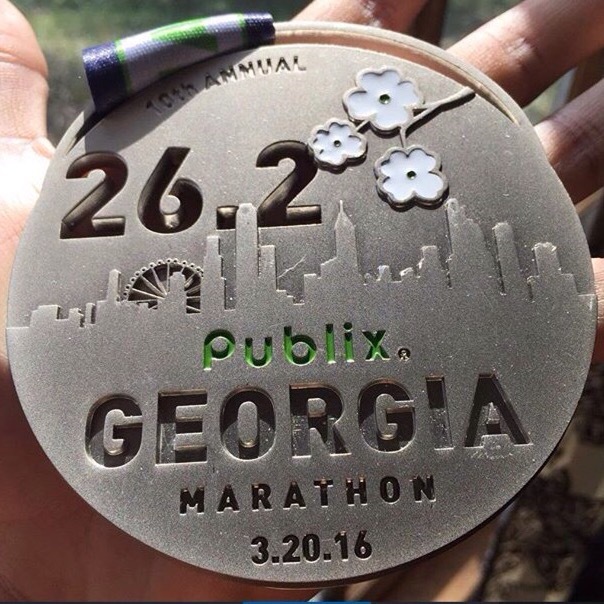 If you are planning to run Atlanta I highly recommend training for the course! The scenery was beautiful as we winded our way through neighborhoods and parks and finally back to the Olympic Park area to end at the same place we started. I finished the marathon in 5:40. After the race Lynette, Barbara and I grabbed a hamburger at Yeah! Burger (another local restaurant with great food). We were dropped off at the airport and said goodbye. We will miss all the southern charm and kindness of Barbara, Marietta and my new Atlanta friends. 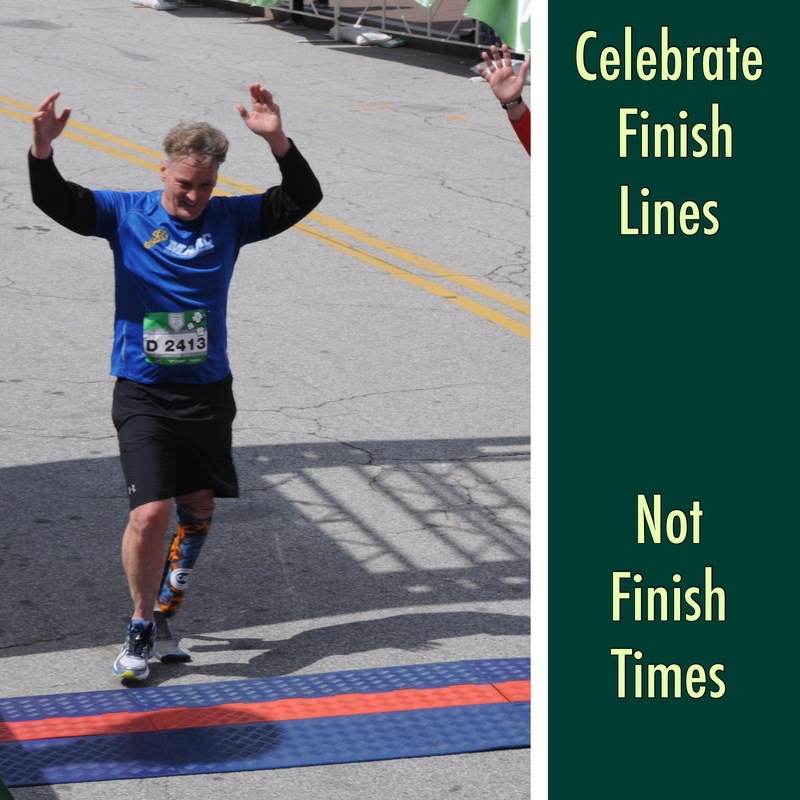 Posted in Georgia, MarathonsTagged 50 marathons, 50 states, adaptive athletes, amputee, athlete, Georgia, marathon, runnerBookmark the permalink.